In this month's Tr3 Trends, we take a look at teacher excessing: what factors determine which teachers to excess, how excessed teachers are assigned to schools, and what happens to excessed teachers who cannot find new assignments. But first, what is excessing and how is excessing different from a layoff? Excessing is the shifting of teachers from one school to another that results from a school reducing the size of its faculty due to a drop in student enrollment, a change in budget, programmatic changes, or because the school is being closed, redesigned or phased out. Unlike being laid off, teachers who are excessed are still employees of the district and, in most cases, are still entitled to a teaching position at a school, but just not the same school that they left. In over half of Tr3 districts, seniority is the primary factor considered in excessing decisions. Only five districts--Denver, Douglas County (CO), Cypress-Fairbanks (TX), New Orleans, and Louisiana Recovery District--use performance to select teachers to excess without considering seniority. Three districts--Wake County (NC), Baltimore County, and St. Louis--only consider the best interests and needs of the school or district. Many districts look at a variety of factors when making excessing decisions. Washington, D.C., for example, uses a rubric with four different factors, of which seniority can only account for up to 10%. The "other factors" districts use to make excessing decisions run the gamut from diversity factors to extracurricular responsibilities. We also looked at how excessed teachers were matched with new placements. 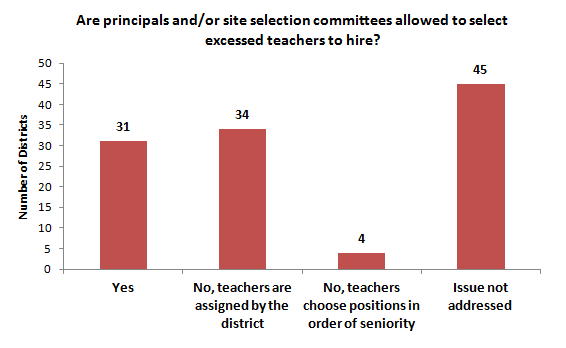 In about a third of the districts, principals or other site-based administrators choose which excessed teachers to hire, as opposed to being placed on the basis of seniority status or assigned by the district's HR office. Thirty-one out of the 114 districts in our database use "mutual consent" to hire excessed teachers, which allows principals to interview and hire teachers of their choosing without regard to seniority. Los Angeles, New York, Miami-Dade, Chicago, Dallas, Fort Worth, and Minneapolis all use this approach. Duval County (FL), St. Paul, Sacramento, St. Louis, and Pittsburgh are a few of the districts in which Human Resources places excessed teachers in schools without seeking input from the principal--at least according to the teachers' contract. In Cleveland, Clark County (NV), Spokane, and Little Rock, teachers are allowed to choose placements based on their seniority. In only six districts in our database, teachers are exited out of the school system--via layoffs, unpaid leave, early retirement, or buyouts--if they are excessed and then unable to secure a new assignment. In most districts, excessing does not lead to layoffs. The six districts include Clark County (NV) and Manchester (NH), which lay off teachers unable to find positions after they are excessed. These districts' contracts do not specify how long teachers have before they are laid off. Little Rock, Chicago, and Douglas County (CO) give teachers temporary assignments (in Little Rock they serve as substitutes) and then if they are still unable to find permanent positions, they are laid off or placed on unpaid leave. In Chicago, teachers have 10 months to find a position and in Douglas they have 12 months. Little Rock's contract does not specify how long teachers have to find a position. They can accept a year-long temporary assignment and continue looking for a position. If they cannot find another position within that year they will be laid off.